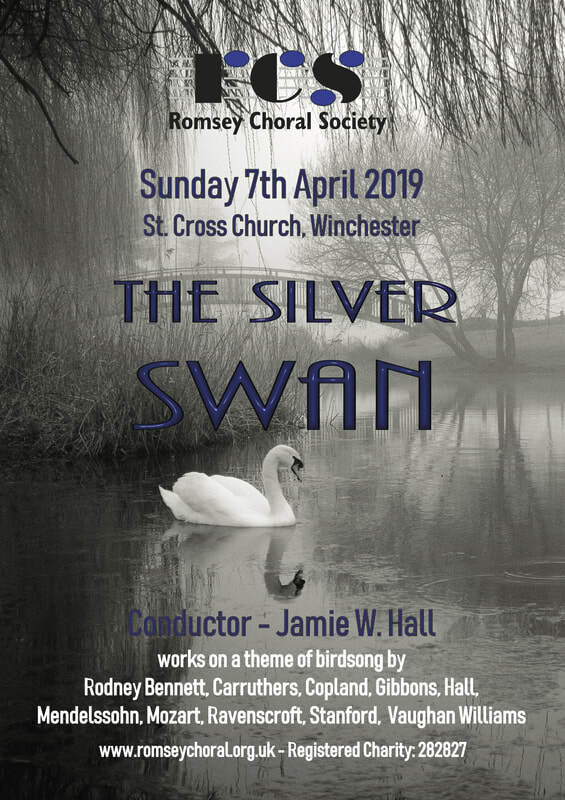 In the setting of the beautiful Church of St Cross, the Romsey Choral Society gave a lovely concert last Sunday evening. The theme was birds, the title, The Silver Swan, and it included songs of turtle doves, swallows, owls, ravens, nightingales, swans, and bluebirds. It was an evening of varied music from folk and madrigals to present day. Songs by Mendelssohn, Vaughan Williams, Holst, Ravenscroft, Stanford and Gibbons were interspersed with Richard Rodney Bennett's early Aviary songs. This was an intriguing programme beautifully sung by Romsey Choral Society. The programme began with two newer pieces, The Birds by Sarah Carruthers is a delightful setting of a Czech carol, and Soul's Flight by Jamie W Hall is a lovely setting based on Bach's Jesu Joy of Man's Desiring, with flautist Anita Hall playing the melody. Various voices from the choir stepped forward to perform various solos, notably in The Widow Bird and in Stanford's The Blue Bird, with its calm vision of a lake and the clear soaring voice of the blue bird. One of my favourite pieces! A fine set of baritones were featured in Ralph Vaughan William's Turtle Dove, (another favourite). Some of the songs were A Cappella and some beautifully accompanied on the piano by Richard McVeigh, who after the interval played a very fine rendition of Bach's Fugue in E minor on the organ. Rounding off the evening was Mozart's Spatzenmesse (sparrow mass. We couldn't forget the sparrows! ), with step out solos, and accompanied by Richard on the organ. The encore treat was The Goslings by Bridge, the story of two turkeys. Hilarious! A treat of a concert indeed, sung to a capacity audience, in beautiful surroundings, and conducted by Jamie W Hall. Jamie has brought this choir to a very fine standard, and directs with superb proficiency. Sadly this is his last concert conducting the choir, as he is leaving to concentrate on his solo career. But he will be back with RCS as soloist in Mendelssohn's Elijah in July. The retiring collection was aptly and importantly in aid of the Wildlife Trust's birds.